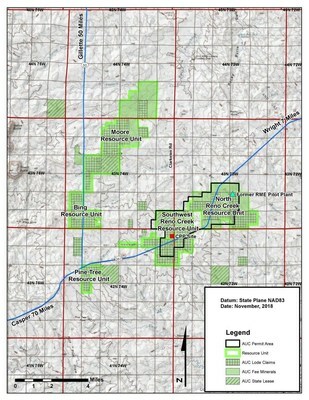 New and expanded M&I mineral resources rank the Project as the largest permitted, pre-construction in-situ recovery ("ISR") uranium project in the U.S.
First time that the major mineralized trends of the Reno Creek ISR Project have been consolidated within the Eastern Pumpkin Buttes District of the Powder River Basin. Considerable ISR exploration and expansion potential within open mineralized trends based on available historical drilling. Added resources benefit from existing production permits in place. CORPUS CHRISTI, TX, Jan. 15, 2019 /CNW/ - Uranium Energy Corp (NYSE American: UEC, the "Company" or "UEC") is pleased to announce the Company has completed an updated National Instrument 43-101 Standards of Disclosure for Mineral Properties ("NI 43-101") resource estimate for its Reno Creek ISR Project ("Reno Creek" or the "Project"). The Project is in the Powder River Basin, Wyoming, and now includes the consolidation and inclusion of the former North Reno Creek project ("North Reno Creek") into the Company's Reno Creek Project. * The report is entitled "Technical Report and Audit of Resources of the Reno Creek ISR Project, Campbell County, Wyoming, USA" dated December 31, 2018 as prepared for the Company by Behre Dolbear, an internationally recognized mining consulting firm (the "Report"). Amir Adnani, President and CEO, stated, "For decades, the Reno Creek uranium district has been unable to reach its full potential due to fractured ownership. Through a string of accretive acquisitions over the past 24 months, UEC has successfully consolidated the key project areas, clearing the path for this substantial new resource, with the benefit of being covered under our existing production permit. We're executing on contrarian acquisitions during difficult years in the uranium market and have amassed a production profile of low-cost and fully permitted ISR projects. Combining Reno Creek with the Company's South Texas ISR projects, positions UEC to lead a renaissance in U.S. uranium production via the ISR mining method, which is globally recognized for being low cost and environmentally friendly." The Company completed the acquisition of the North Reno Creek project in May 2018 (press release dated May 3, 2018), and since that time has been focused on updating resources, consolidating permits, merging databases and locating all Project related information into a newly opened office in Glenrock, Wyoming, near the Project. Figure 1 shows the location of the entire 19,769-acre Reno Creek property area. 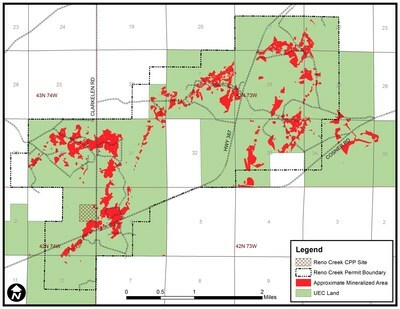 Figure 2 shows the 6,053-acre permit area covered by Permit 824, Reno Creek ISR Project Permit to Mine, issued by the Wyoming Department of Environmental Quality ("WDEQ") on July 17, 2015 (the "Permit"), and associated mineralized trends. A Source and By Product Materials License for Reno Creek was issued in February 2017 from the U.S Nuclear Regulatory Commission ("NRC"), supported by a Final Environmental Impact Statement and Record of Decision, to permit production of up to 2 million pounds U3O8 per year. On September 30, 2018, the State of Wyoming became an NRC Agreement State, which gives the State the authority to regulate in-situ recovery facilities in Wyoming. From this date forward, UEC will only be required to work with the State WDEQ for Permit revisions, which will streamline the process to include the North Reno Creek resources under the existing Permit. The Reno Creek Project is in the Powder River Basin of northeast Wyoming, one of the most prolific uranium producing regions in the U.S. and the home of five ISR uranium mining operations: Cameco's Smith Ranch/Highland and North Butte, Uranium One's Willow Creek, Energy Fuels' Nichols Ranch and Strata's Lance project. The Project is less than 10 miles from the nearest town of Wright, Wyoming with a population of 1,800. Substantial historical exploration, development and permitting work has been completed on the Reno Creek property, beginning in the late 1960s and continuing to present. Approximately 10,000 uranium exploration drill holes have been completed within and near the Project area by various operators over this time. Currently, Company geologists are reviewing the historical data to assess the development of additional resources along 12 miles of partially defined mineralized trends within the currently held acreage. Development of a conceptual mining plan to support a revised Preliminary Feasibility Study is underway and the Company is planning on completing this document in 2019. The technical information in this news release has been prepared in accordance with the Canadian regulatory requirements set out in NI 43-101 and was reviewed by Robert D. Maxwell, CPG, a consultant for the Company and a Qualified Person under NI 43-101. Uranium Energy Corp is a U.S.-based uranium mining and exploration company with additional titanium and vanadium assets. The Company's fully-licensed Hobson Processing Facility is central to all its uranium projects in South Texas, including the Palangana ISR mine, the permitted Goliad ISR project and the development-stage Burke Hollow ISR project. In Wyoming, UEC controls the permitted Reno Creek ISR uranium project. Additionally, the Company controls a pipeline of advanced-stage uranium projects in Arizona, Colorado, New Mexico and Paraguay. The Company also controls a large high-grade titanium project in Paraguay and significant vanadium resources in combination with its Slick Rock uranium project in Colorado. The Company's operations are managed by professionals with a recognized profile for excellence in their industry, a profile based on many decades of hands-on experience in the key facets of uranium exploration, development and mining. The mineral resources referred to herein have been estimated in accordance with the definition standards on mineral resources of the Canadian Institute of Mining, Metallurgy and Petroleum referred to in NI 43-101 and are not compliant with U.S. Securities and Exchange Commission (the "SEC") Industry Guide 7 guidelines. In addition, measured mineral resources, indicated mineral resources and inferred mineral resources, while recognized and required by Canadian regulations, are not defined terms under SEC Industry Guide 7 and are normally not permitted to be used in reports and registration statements filed with the SEC. Accordingly, we have not reported them in the United States. Investors are cautioned not to assume that any part or all of the mineral resources in these categories will ever be converted into mineral reserves. These terms have a great amount of uncertainty as to their existence, and great uncertainty as to their economic and legal feasibility. It should be noted that mineral resources which are not mineral reserves do not have demonstrated economic viability. It cannot be assumed that all or any part of measured mineral resources, indicated mineral resources or inferred mineral resources will ever be upgraded to a higher category. In accordance with Canadian rules, estimates of inferred mineral resources cannot form the basis of feasibility or other economic studies. Investors are cautioned not to assume that any part of the reported measured mineral resources, indicated mineral resources or inferred mineral resources referred to herein are economically or legally mineable.